If you live around Cedar Rapids or Iowa City, you may have seen our traveling billboard on I-380. 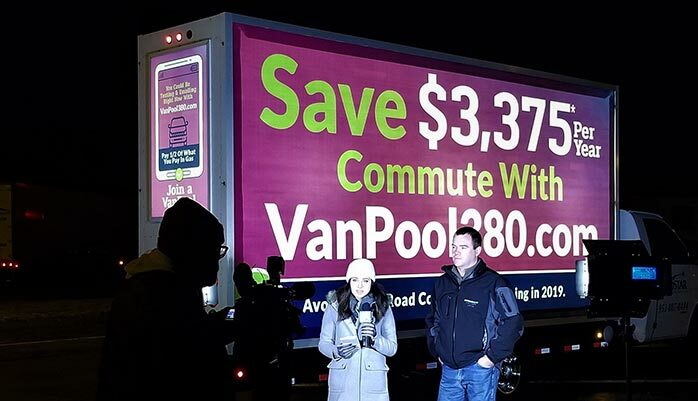 We are encouraging commuters to consider a VanPool in an effort to reduce the number of vehicles on the road as construction ramps up for the I-380/I-80 project. For more information on VanPools, visit www.VanPool380.com. Image: KCRG reporter Alicia Tarancon interviews Brock Grenis, transit administrator and planner for ECICOG, parent organization of CorridorRides.